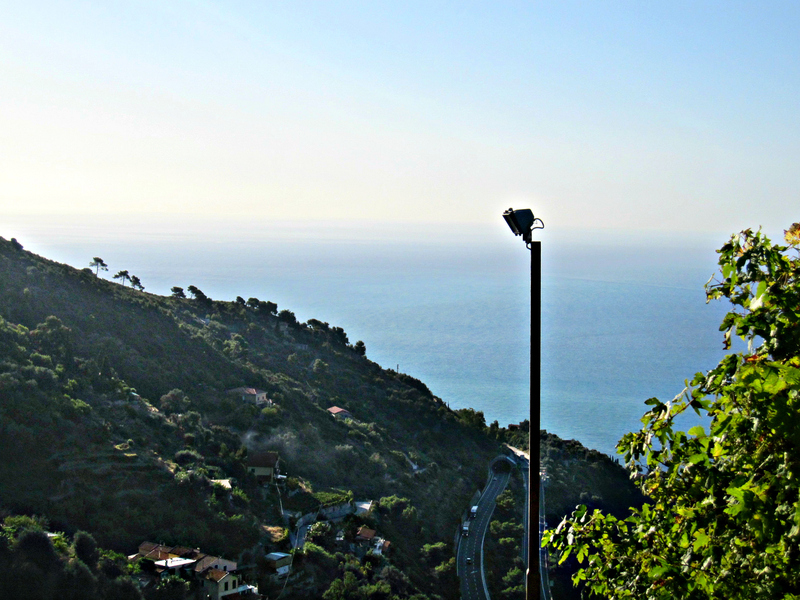 Mortola Superiore is a tiny village on top of a crag in Liguria, close to the Italian border with France. And it’s all about the view. 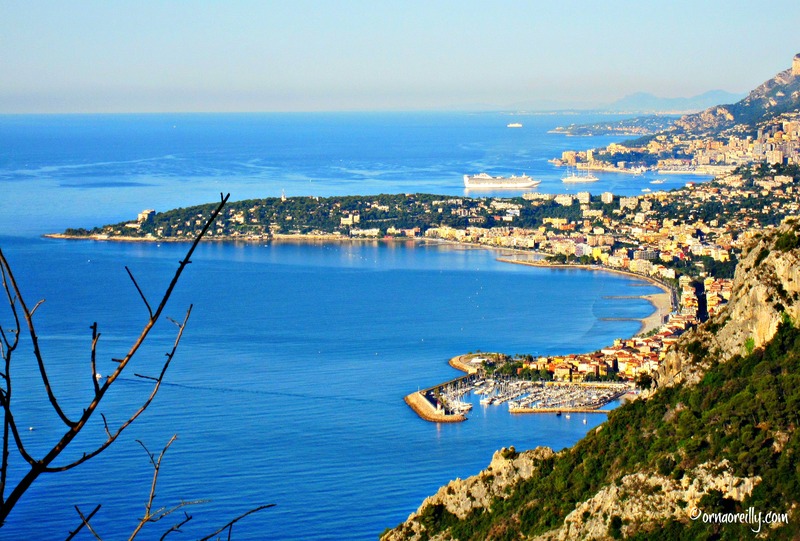 Standing at the edge of the piazza, one overlooks Menton, with Cap Martin in the background. 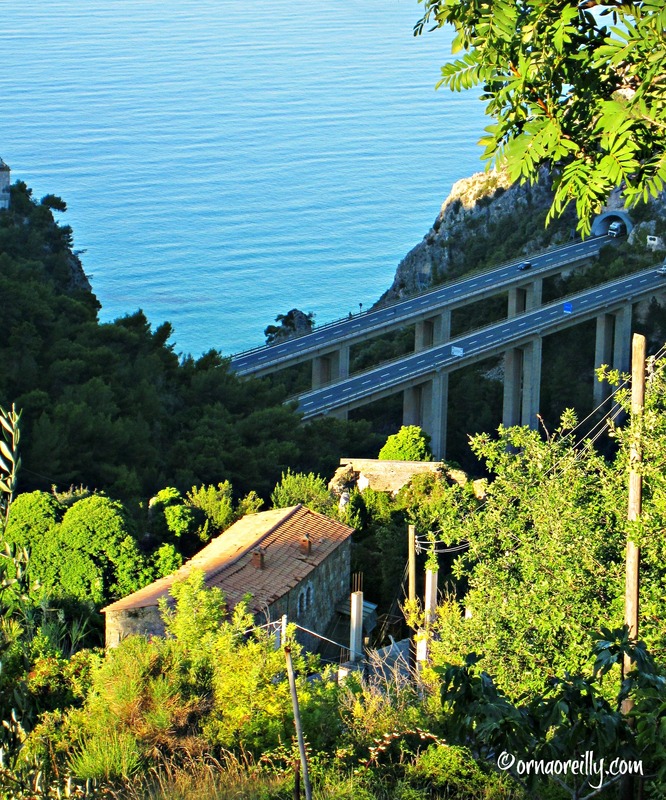 Also visible is the autostrada, a feat of engineering on stilts, called Fiori Autostrada or Motorway of the Flowers, which connects Genova with Ventimiglia and the French/Italian border. 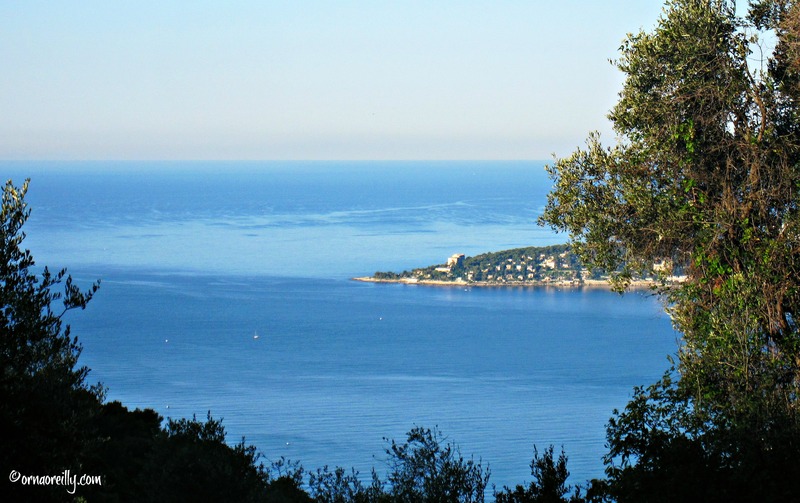 On my solo visit a few years ago, I arrived in Menton, on the French side, by train and was met by the owners of my chosen B&B, Alto Blu. 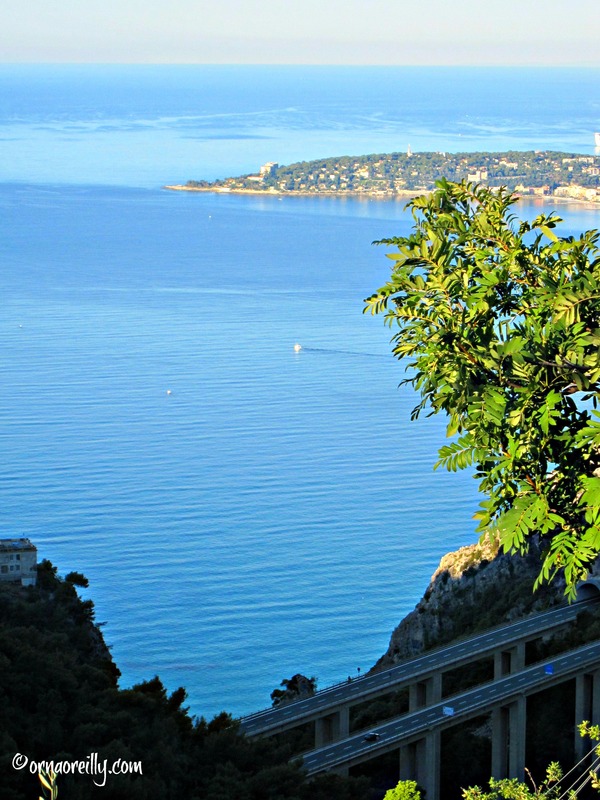 I honestly had no idea that Mortola Superiore was so far above sea-level and, as I was there for a week on the beach, I was faintly alarmed when my hosts’ car began the very steep climb from the coast to the top of a 300 metre crag overlooking the Mediterranean far below. ‘Is there a bus to take me to the beach?’ I asked in trepidation. The answer was, unfortunately, ‘No!’….’But we can drive you down when you need a lift!’ they added helpfully. 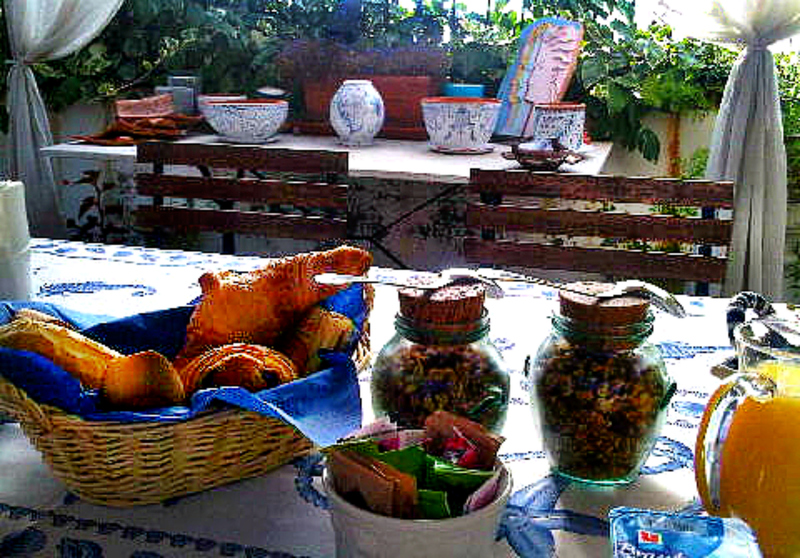 The breakfast at Alto Blu with fresh croissants and muesili was delicious. It was mid-August and the weather was hot, but next morning I decided to walk down to the beach. It was 5 kilometres, no problem I thought. I felt strong. The walk downhill was easy. Early morning, not too hot, I found myself walking past the famous Villa Hanbury with its renowned botanical gardens. 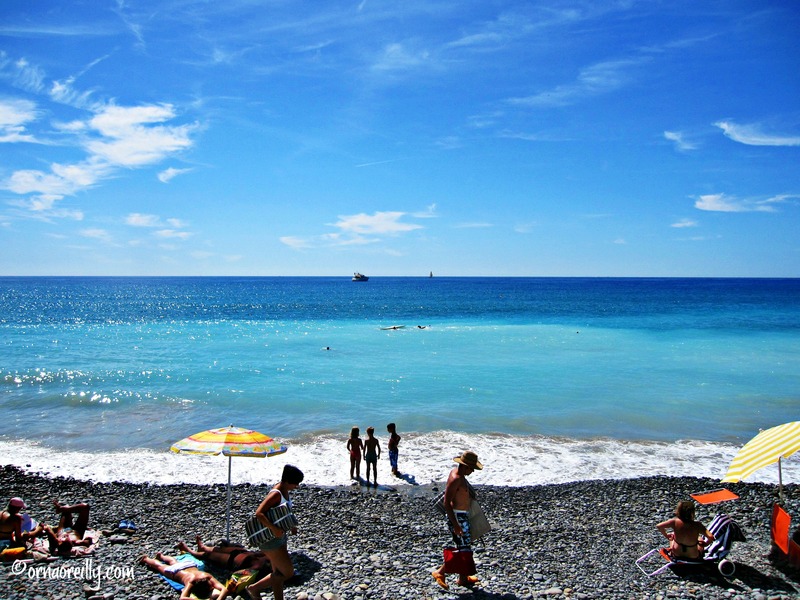 Within the hour, I was in the small town of Latte, at a beach concession called Villa Eva, lying back on my sun lounger with a shady umbrella, my Kindle and my sun cream. Towels had been provided and I had a wonderfully relaxing day, dipping in and out of the pool to keep cool. 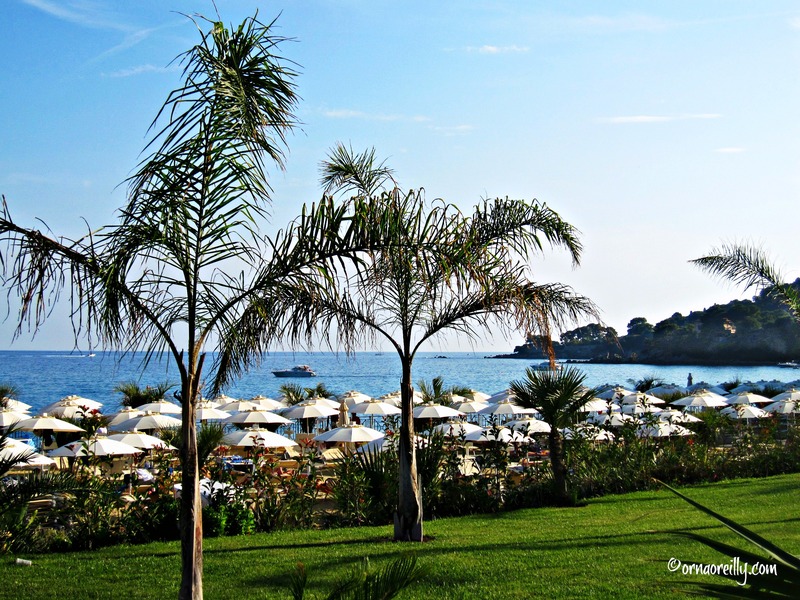 I loved Villa Eva with its choice of swimming in either the sea or the large pool. Lunch under an umbrella outside the restaurant was a treat and I felt myself pleasantly unwinding. At around 4pm I decided to stroll the 5 kms back to Mortola Superiore. But first of all, a visit to the local Conad Supermarket in Latte was on the agenda, where I purchased a bottle of wine for my fridge and a slice of vegetable quiche. I then set off uphill. The late afternoon sun shone full on my face and a hot breeze made it necessary to keep one hand on my head to stop my large straw hat from blowing off. Turning off the busy main road I began the steep climb up the winding road which led up to the top of the crag. Even though I was pretty fit at that point, I found the going very tough as the narrow mountain road snakes vertically from the coast. I considered abandoning my bottle of wine, which now appeared to weigh a ton as I struggled on. As I crossed over the motorway, I realised that I was only about half way to the top. The last set of steps seemed interminable, so it is not surprising that my hostess, the artist Luciana who was chatting to a neighbour in the piazza, looked startled as my tomato-red face appeared at the top, and I finally arrived at my destination. I was completely exhausted and my hip joints ached for a few days afterwards. In fact, I thought they might actually have come loose! After that, though I would walk down to Latte in the mornings, I organised a taxi driver by the name of Marco, to drive me back to the B&B at 6 pm every evening. It was money well spent. 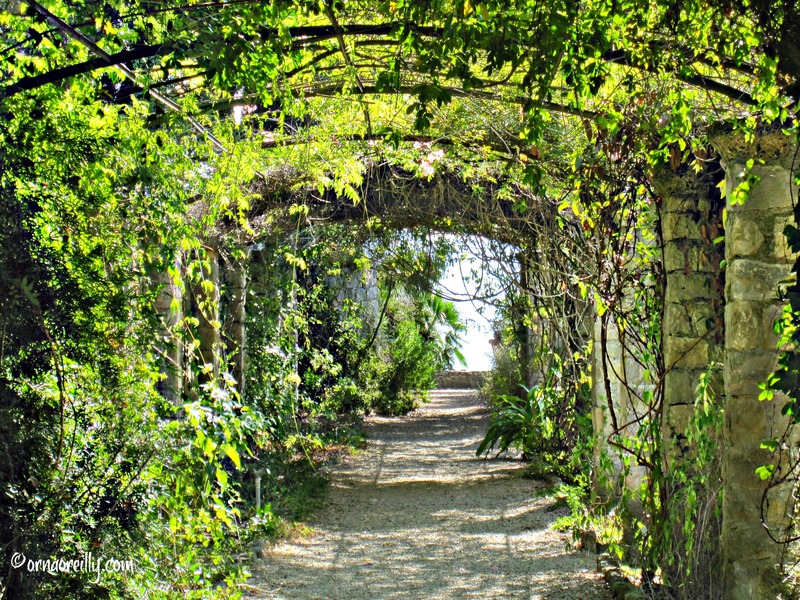 One morning, instead of heading straight for the beach, I decided to visit the gardens at Villa Hanbury, Giardini Botanici Hanbury. 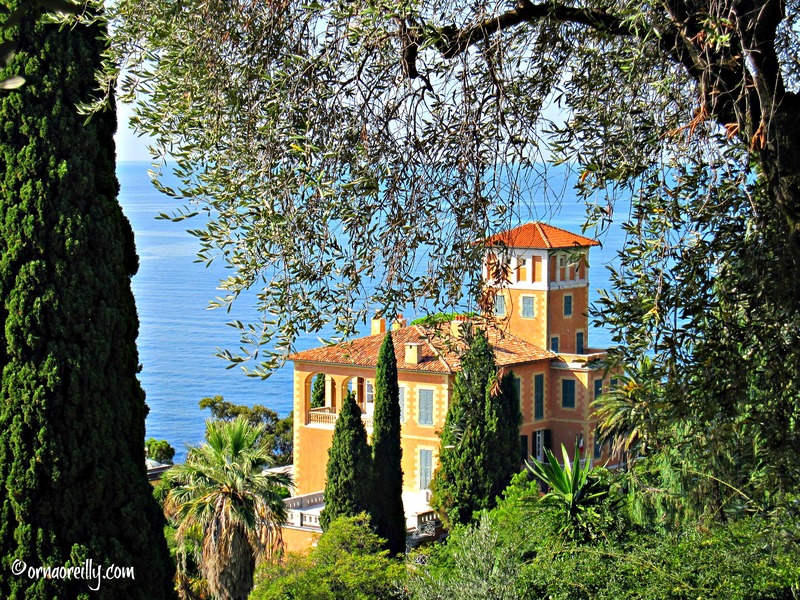 Apparently, a young man called Thomas Hanbury bought the original villa in 1867 and decided to create a large 18 hectare garden, its steep slopes filled with exotic plants. 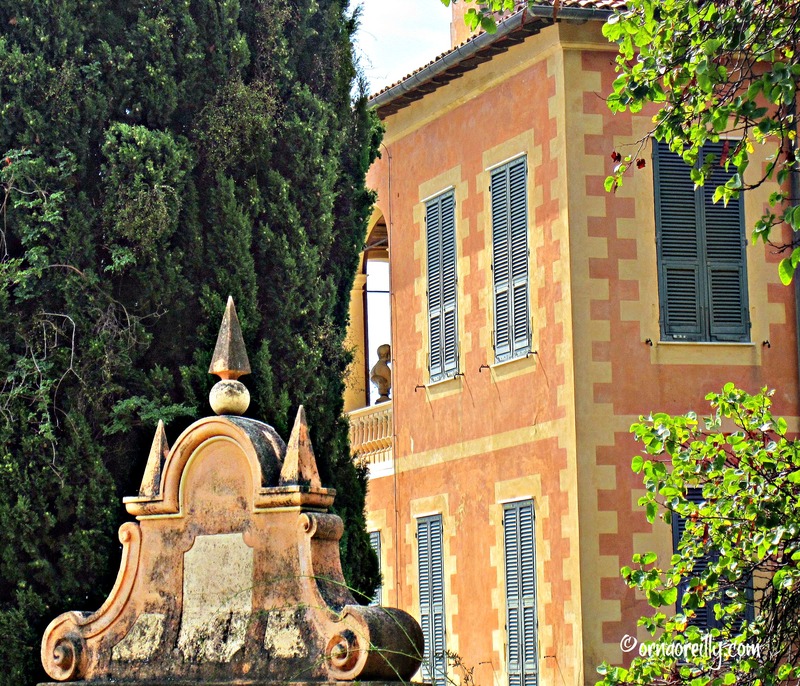 He also renovated the villa, which had belonged to Marchesi Orengo. 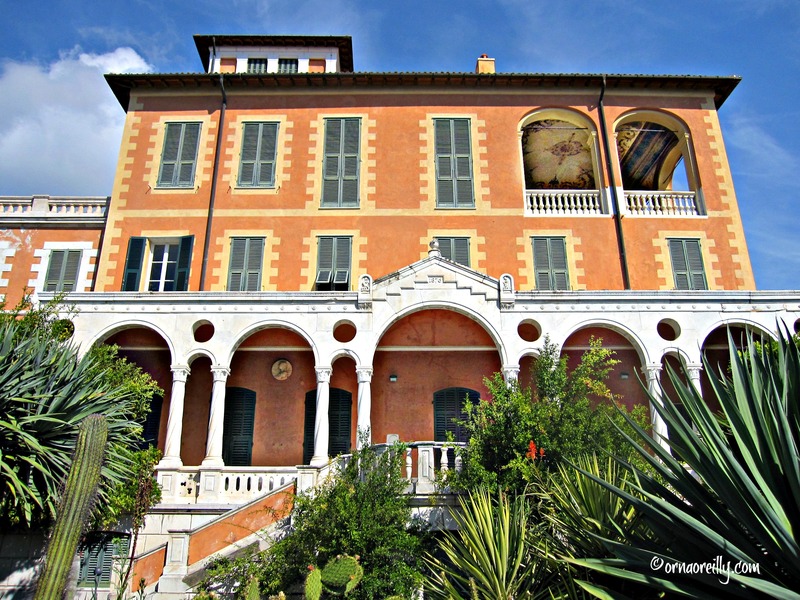 The villa and gardens were purchased by the Italian State in 1960 and transferred to the the care of Genoa University in the 1980s. 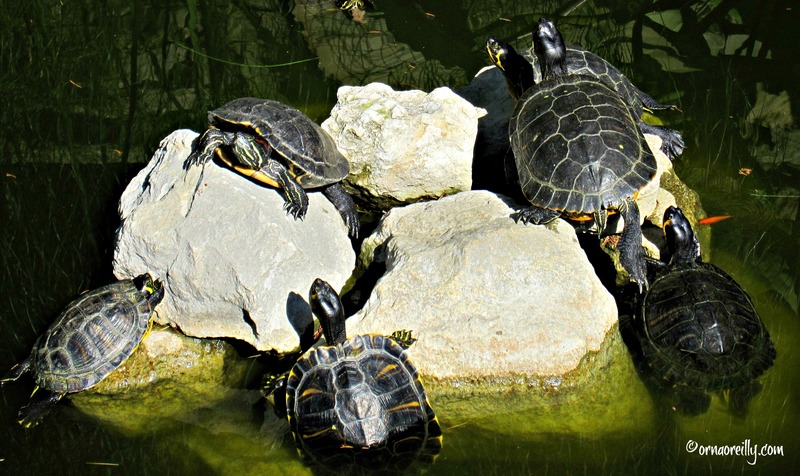 Mainly due to the operational skills and close attention given by the University, the botanical gardens are now considered one of the great gardens of the world. Most evenings, when not eating vegetable tart on the veranda outside my room at Alto Blu, I ate at a rustic local restaurant called Il Cippo. Pronounced ‘Il Cheapo’ the food there was simple and very good. And inexpensive! Mortola Superiore is part of the Municipality of Ventimiglia in the province of Imperia in the region of Liguria and is about 7 kilometres from Menton on the French side of the border. I had a wonderful week in Mortola Superiore and Villa Eva. I was truly sorry to leave. A lovely read, Orna. Thanks for sharing your adventures and your excellent writing. It looks fabulous. How brave to attempt that walk! Now, why didn’t I think of that? !